Please read all of this page prior to contacting us about CNC Toneboard Milling - there are a lot of things involved and the more you know the better we can help. We have only one fixture for milling Arkansas Style Duck Call toneboards - and there are some specific requirements to be able to use our fixture. We can not currently do LA Style duck soundboards. Currently only 5/8" (.625") diameter tenons for Arkansas style Duck Call sound boards can be machined. May be as small as .620" but chatter may be increased or accuracy may be reduced do to loose fit in the fixture. You may supply the inserts to have the sound board milled, or we can turn inserts for you (see CNC Turning). Accuracy and consistency are paramount for quality soundboard cutting. If we CNC Turn your inserts, it will be at your discretion if we send them to you for polishing prior to cutting the toneboard, of if you want the toneboard cut onto the unpolished insert. We STRONGLY suggest the use of either a flange or an O-ring groove in your design for maximum accuracy. The cork notch height MUST NOT BE shorter than 0.140" (tall - ie 0.140" thick cork). That is the smallest corn notch that can be milled with our current tooling. The back of the cork notch will be ROUNDED. It will NOT be square. The tool used to cut the soundboard is round (think similar to a slotting router bit). You will need to file the back of the cork notch square once you have received the parts. Cork Notch squaring may be available on soundboards with a parallel board design (it is not upsloped) - but it is very dependent on the profile and we will not know if it is possible to do or not until the board has been mapped - so we mention it here as a possible option, and if it is available for your part, it will be offered to you. If your insert has an O-Ring - the closest edge/face of the O-ring groove MUST be at least 0.200" from the back of the cork notch for strength of the cork tang and to avoid any marring of the surfaces when mounted in the fixture. Soundboard profile mapping and setup/programming charge is $175.00. If we have made a custom jig for you, and already have the profile on file to use there will be a $100.00 discount. We reserve all copies of cad files, drawings, and programs. These prices do not include a copy of the CAD file. Setup/Programming is a ONE TIME fee per soundboard design. Toneboards can be milled on Cast Acrylic, Delrin/Acetal, Aluminum, and Brass. Pricing for tonebaord machining varies depending on the amount of material removed. As a rough estimate, one would likely expect a cost between $4.00 and $6.00 each for machining costs on Acrylic and Delrin. Materials such as Aluminum and Brass will be roughly double. This is only for milling the toneboard. If tone channel drilling or "finishing to depth" is required, that will be an additional charge and included with the turning portion of our services. Turn around time will depend on the current workload. If you would like a firm quote, please contact us via email with your information, specs, quantities, drawings and or pictures. You may send your prototypes to us for a more accurate estimate/quote. Please include $6.00 for return shipping of your prototype plus any additional insurance you require. WFCC is not responsible for items lost by shipping carriers. Note: We WILL NOT copy any of the guts we sell for anyone. The SR101, SR102, and SR103 guts are our design, if you want them in a custom custom color, that is possible as long as the minimum quantities are met. But none of the other guts are our design to replicate, and we will NOT copy them for anyone. Soundboard profile mapping and setup/programming charge is $150.00. If we have made a custom goose gut jig for you, and we already have the profile on file to use there will be a $75.00 discount. We reserve all copies of cad files, drawings, and programs. These prices do not include a copy of the CAD file or program. Setup/Programming is a ONE TIME fee per soundboard design or gut blank design. The Diameter of the gut blank may be anywhere between 0.6160" and 0.6250"
Gut Blanks may be drilled or left undrilled (so that you can route in the tone channel later). We can turn and bore goose gut blanks for you if you just want blanks without any milling done. Setup fee is 25.00 for the design and programming of a gut blank and wedge blank combination (includes any location grooves, etc). Turning cost is $2.00 per set plus material - minimum run is 150 gut/wedge blank sets (appx 19 gut/wedge blanks per 4' stick of material). Material size must be 3/4" or smaller or there will be added cost for the blanks. 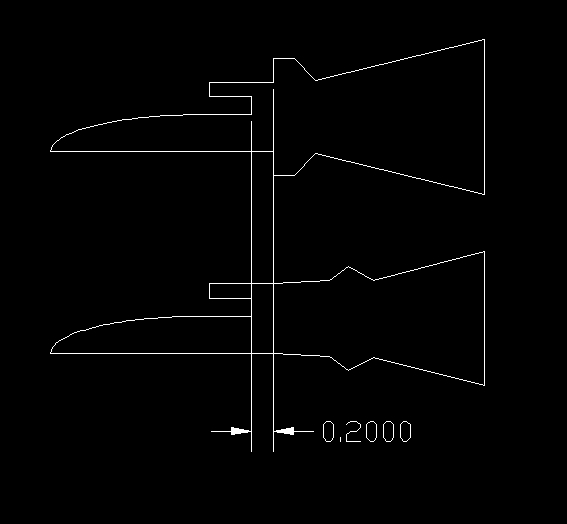 You will need to specify any tuning marker grooves and tone channel diameter, depth and radius of the tip. Material choices of Cast Acrylic, Acetal/Delrin, or PVC. Other materials may carry an additional cost. Please email if you are have a different material choice. We will not CNC turn wood. We can NOT mill reed locating tangs on guts at this time (like the SR1 gut has). The gut blank itself MUST BE 0.600" Long (+/- .010") This is critical! The Diameter of the gut blank may be anywhere between 0.6160" and 0.6250" - the closer to .625" the gut is, the more accurate and repeatable the deck height will be and surface finish will be better. This is due to the fixture having a .625" trough. It can hold .616" guts, but they can wiggle around in there a little and that can create inconsistencies of a few thousandths. Please note, small runs are not very economical, but larger quantites can be afforded some discount. Quantity discounts start kicking in at 400 sets, and the discounts increase as the quantity increases to a ceratin degree. If you need suggestions for a supplier for materials, we regularly receive drop shipments from Delvies (acrylic) and Midland Plastics (Delrin/Acetal, Colored Acetal, Acrylic, and PVC).